We’ve been hard at work on a complete rewrite of the CHN App! Almost everything in the app has been overhauled for better stability and performance and a bunch of new features have been added, including iPad support and stats. Some features now require an in-app purchase to activate. This was not a decision come to lightly, but please click here for more information on why we did it and what’s new in version 2.0. Features which require CHN Premium are highlighted in bold below. 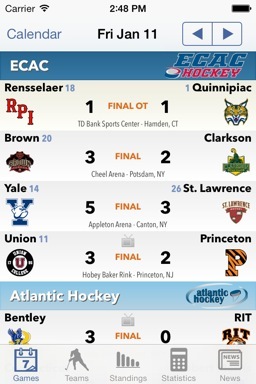 Every game for every team with scores, arena, game time, and shootout results. 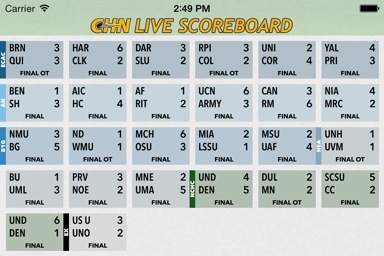 CHN’s exclusive Live Scoreboard will keep you up-to-date for most games currently in progress. You can also enable goal alerts and final score alerts, as well as pre-game notifications, for your favorite team and up to five additional teams. 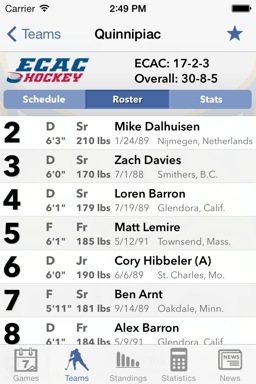 View game details, including scoring, rosters, and TV information. You can even Tweet game scores from within the app. View game stats, lineups & starters, Tale of the Tape for each team, as well as game events including goals, penalties and goalie changes. 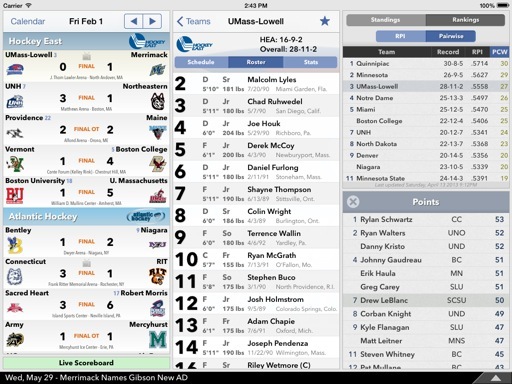 Records, rosters, schedules, and sortable team stats for each Division 1 team. Your favorite team and up to five additional watched teams will be highlighted throughout the app and you can receive goal, final score, and game start notifications. While in the app, you will be notified when a goal is scored in any game. 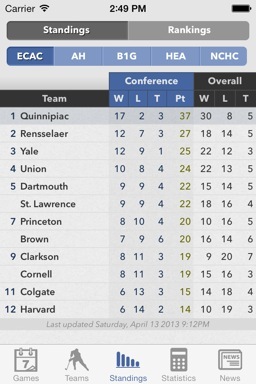 View standings for each conference along with conference and non-conference records. 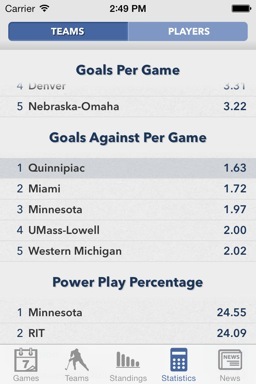 Around the halfway point in the season, Pairwise rankings will also be shown. 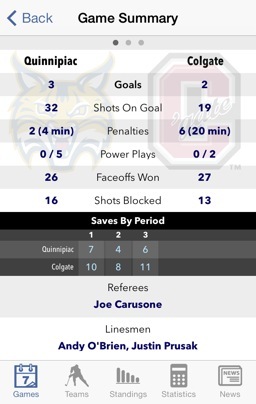 A wide assortment of team and player stats are available and each can be expanded. 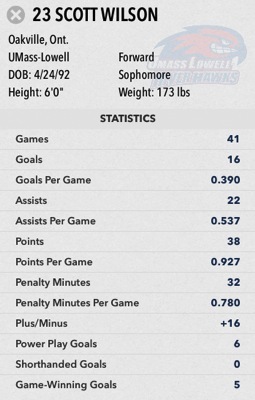 Tap on a player to bring up a detailed look at their information and stats. Rotate your phone to get a live look at all the day’s games at a glance. 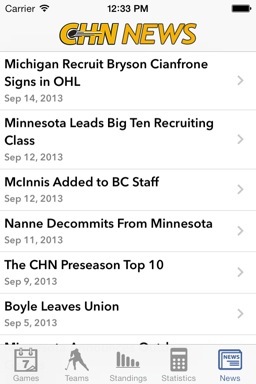 Stay on top of the latest news with College Hockey News’s top-notch reporting all year long. You can also receive breaking news alerts. All the features above are available in a one-screen view on iPad in any orientation! - Make sure the current version of the CHN app is installed and run it. - Exit the app and run your iPhone/iPad's "Settings" app. - Tap "Notifications" and find "CHN" in the app list. Tap it. - Turn "Allow Notifications" off and on. Exit and relaunch the CHN app.